This anthology of new stories featuring Norman Daniels' pulp hero Jeff Shannon, aka the Eagle, has two stories with crossovers. In Bobby Nash's "Lights! Camera! Sabotage!," Agent Palmer of the FBI assigns Shannon to go undercover on the set of a film directed by a suspected saboteur. 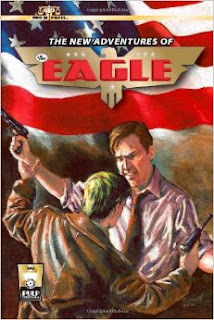 Agent Palmer also appears in Nash’s comic book Lance Star: Sky Ranger – One-Shot! (illustrated by James Burns) and the upcoming novel Lance Star: Sky Ranger – Cold Snap. His grandson is FBI Agent Harold Palmer, the protagonist of Nash’s novel Evil Ways, as well as its forthcoming sequel Evil Intent. Both novels are part of a series of thrillers set in Sommersville, Georgia. Since Lance Star and the Eagle are both in the CU, so are the two Agent Palmers. In Teel James Glenn's "The Coming Storm," Secret Service agent Rex Bennett assigns Shannon to rescue a kidnapped scientist. Shannon has read a series of articles about German Bunds by “that Donovan guy at the Daily Star.” Shannon’s friend Lefty Kovaks tells the disguised hero that he looks like a regular man of bronze, to which Shannon responds that that name is taken. Shannon consulted with an old instructor of his in New York, Andrew Mayfair, a noted biochemist, to create an antidote to any truth serums or sedatives he may face. Rex Bennett is from the film serials G-Men vs. the Black Dragon and Secret Service in Darkest Africa. Donovan is Moxie Donovan, an original character created by Glenn who appears in the collections Deadline Zombies: The Adventures of Maxi and Moxie and Headline Ghouls: The Further Adventures of Maxi and Moxie. The man of bronze is Doc Savage, of course; Andrew Blodgett “Monk” Mayfair is one of Doc’s five assistants. I think it us cool that Rex Bennett is in. I own those two serials and think that they are great fin.